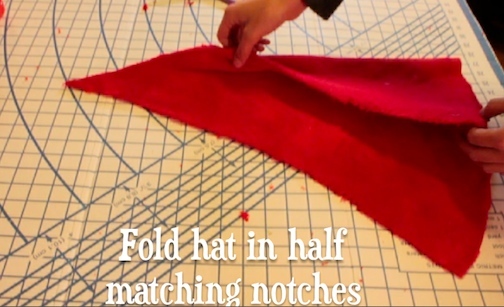 Make Santa Hat in less than an hour. 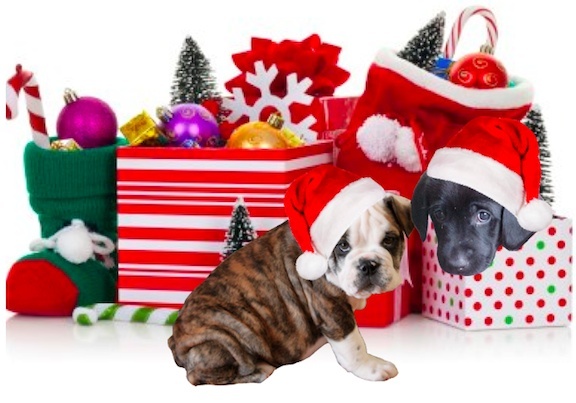 Otis is an Olde English Bulldogge and is 9 weeks old in this photo. His cousin, Cody, the Black Lab, is also a couple of months old in this photo. Cody is about 5 years old now, and Otis is now 7 months old. For more photos of Otis and the story of his life, check out Bulldog Photos. 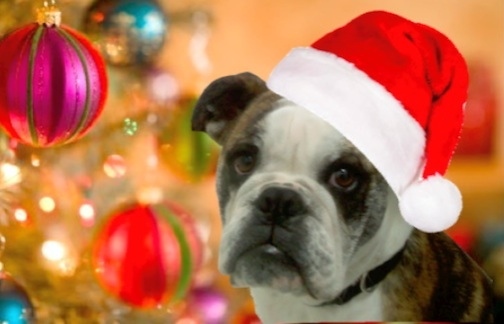 As far as making a Santa hat for the dogs, or any animal, just measure the circumference of their head at the widest point. Probably enough to go over the ears. Most likely it'll be a smaller version of the adult hat size. Add a seam allowance of a half inch on each seam. If your working with scraps of fabric, and you have barely enough, you could go with less of a seam allowance. You could also zig-zag the edge for a finished looking,and more importantly, to minimize the seam fraying. If this hat is for a pet photo one time only, then it won't need to be super duper strong, but if you hope to use the hat year after year, and wash it often, then some extra reinforcement (sewiing seams twice) would be a good idea. Warning: Make sure your machine can handle it. It gets thick and sheds. Here are tips when using HEAVY FLEECE. When using red heavy fleece like we used here, wash it at least once to minimize the fabric shedding. It can clog your machine and cause a lot of trouble. Washing and drying will get rid of a lot of the loose stuff. Also clearing loose fabric debris from around your needle, as you go will helps a lot. If you"re buying the fabric new, be sure to take note of the washing instructions on the bolt you buy it from. Later you may not remember how to care for it, and there's no label to tell you. The white fur had no problem with shedding, but hand washing is recommended in this case. I didn't wash the white before sewing, but I did wash and dry the red fleece twice. I have found the white faux fur I used here washed up nicely first time. In this example the white fur trim is 6 inches wide and 30" long. It's doubled over for a thicker trim. 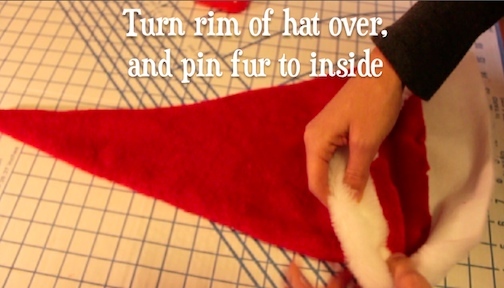 To simplify this beginner sewing project even more, you could use a 3 inch wide strip of white fur and sew it to the rim of the hat, and leave it at that. No inside pinning or extra fur needed on inside rim (little easier & less fabric. If you're using scraps, then obviously you can't check the bolt, but you very likely have washed it if you used it on another project. It's such a small inexpensive project to begin with there's not a lot of risk here. Simplicity pattern #4015 is great because it has everything figured out for you. Especially if you happen to own the pattern already. 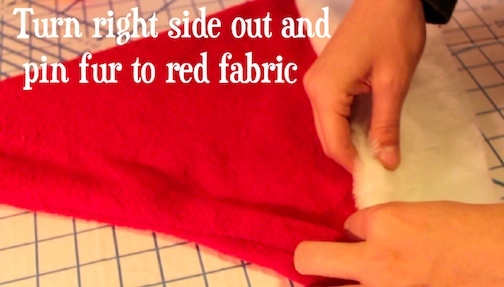 If you use an old Santa hat as your pattern, just remember to add a seam allowance. 1/2 inch to 5/8" on each of the 3 sides would be ideal. Measure the head of the wearer and add the seam allowance of 1/2" or 5/8th". If you don't have either of the above, then make a template out of newspaper or butcher paper (whatever you have). When your satisfied, start laying it out. Interfacing can be added to just about any garment to give it structure. There are many types of interfacing to choose from. Heavy, medium, or light weight. Iron on, sew on, double sided iron on, etc. 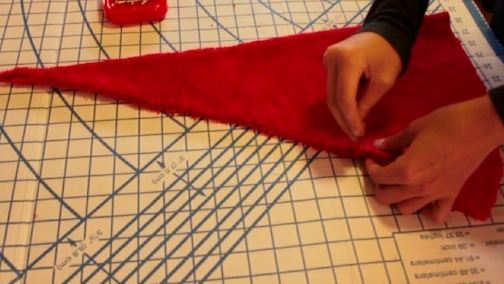 In the case of this Santa hat, no interfacing was used, although the pattern does call for it. In the case of a witches hat where you'd want it to stand up, a heavy interfacing would be ideal. In some garments a lining will do. It's a matter of personal preference and what end result your looking for. When laying out any project, try and get the fabric square on the table. A cardboard grid like the one pictured here does a great job of that. If you have a machine finished edge left in the scrap you may be using, then put that machine finished edge up against the lines on the grid. The other edge is likely the cut edge. The cut edge should also be aligned on the grid. If not, then trim the cut edge so that it lays square on the table with each edge aligned along the grid lines. Notice the photo above. It's pretty straight considering it was a scrap without machine edges. In the case of a Santa hat it's not such a big deal, but when making a fitted garment it matters. In the case of the pattern, clip notches on each side. The main thing is when you fold the hat lengthwise, make sure the hem, and tip of hat match up. Since this fleece stretches, use enough pins to keep the seam in place. Remove the pattern, and with right sides together match the notches. In the case of the red fleece, it's hard to figure out which is the right side, so just pick the side you want to face out, and fold it over as pictured here. Pin in place. 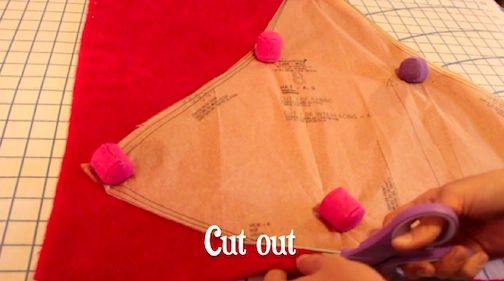 If you are not using a pattern, just make sure to line up the top edge, bottom edge, and middle, then pin in place. Beware of loose or shedding fleece. Keep it out of the area of your needle. Since this fleece stretches quite a bit, start sewing the seam from the middle to bottom. Then turn hat around, starting from where you left off, and sew the seam from middle to tip top. 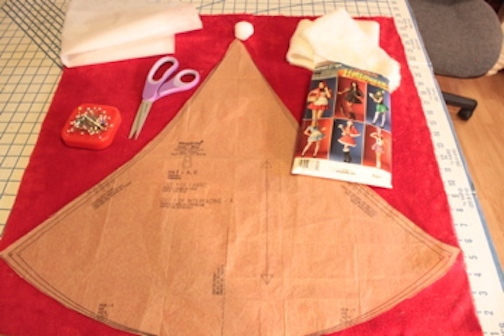 This is not a bad idea for a lot of projects since fabric sometimes stretches and leaves you with too much fabric at the end of the seam, resulting in an uneven hem, and an ill fitting garment. In this case were just talking a Santa hat, so it's likely to fit even if the seams off. Turn hat right side out, and attach white fur to the right side of the lower edge of the red fleece. Pin to the red fleece. In this example the white fur is folded in half all the way around the rim. Then pinned on the inside. After pinning the top, fold the white fur trim over and pin to the inside all the way around. Keep all the pins on the outside where they can be seen and pulled out when sewing. Might be slightly awkward pinning the inside from the outside, but it's better than a broken needle. If your short on the white fur, or would like to make this project even easier, then another option is to sew a single strip around the rim. Appx 2" of trim is what ends up showing in this example, but you can make it to your liking. One big advantage to sewing your own. Start sewing at the seam, along the edge of the white fur (pictured above), making sure to catch both layers of fur and the red fleece. The pins should be doing the heavy lifting here, but be sure to pull them out as you go. Sewing over pins can break needles and loosen stitches. Be sure to back stitch at the beginning and end. Turn the hat inside out and finish the white fur rim by sewing it closed. If there's any unevenness in the rim, just smooth it and restitch over the old seam taking in any uneven stitching. Almost done with this "Make Santa Hat" beginner sewing project. Use white thread and needle. Knot the threaded needle, and push through a little piece of the white fur ball. Then on outside tip of hat pull thread and needle through the tip. Then back through the white fur ball, and repeat a couple of times. Keep the stitches right on top of each other so the ball can move. Also keep the stitches at tip of hat so that the white ball will hide the stitches. 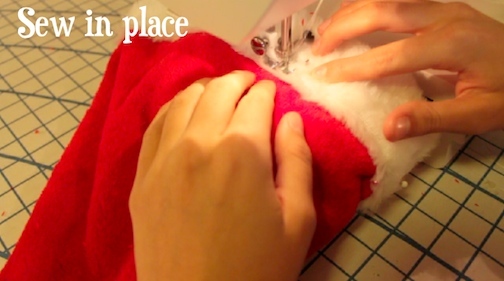 Hope you enjoyed "Make Santa Hat" Happy Sewing!